Meet other guests and eat at the complimentary reception. A complimentary continental breakfast is served daily from 8 AM to 10 AM. Don't miss out on recreational opportunities including an indoor pool and a sauna. 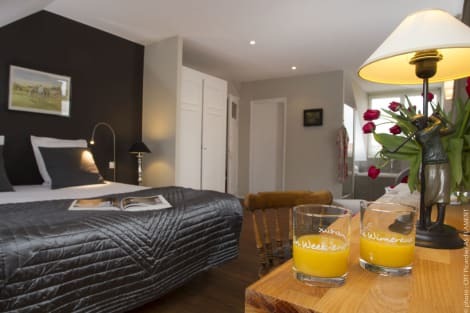 Set between the port of Calais and Boulogne-sur-mer, Wimereux hotels are based in a relatively undiscovered town in northern France on the beautiful Côte d'Opale. It was Napoleon who ordered the port of Wimereux to be built in 1803 as he was planning his intended invasion of England. The town took quite a battering during the First and Second World Wars but is once more gaining popularity as a tourist destination close to the port of Calais. The town is an excellent destination for a range of outdoor activities, including water sports such as windsurfing, swimming and yachting. The town also features an 18-hole golf course with stunning views of the English Channel that on a good day see as far as the white cliffs of Dover. Artists and writers including J.M.W. Turner, Eugène Boudin, Victor Hugo and Charles Dickens have celebrated the Côte d'Opale region as an area of exceptional natural beauty. The Caps et Marais d'Opale Natural Regional Park lies inland from Wimereux and is a breathtaking area to explore. There are a fantastic variety of walking and cycling routes to enjoy here for all ages and levels of ability, encompassing beaches, dunes, swamps, cliffs and forests. There is also an impressive abundance of wildlife in the region, making the Côte d'Opale an ideal destination for bird spotters. A short journey south along the coast from Wimereux will take you to Boulogne-sur-Mer, the largest city in the region. There are plenty of historical and cultural points of interest here, as well as a wide range of shops, cafés, marketplaces and restaurants. The 19th-century Basilica of Notre Dame is one of the most prominent buildings in the area and features a grand 83m dome. The Belfry, built in the 12th, 13th and 18th centuries is a UNESCO World Heritage Site. The medieval crypt below the Basilica is the largest in Northern Europe and definitely worth visiting. To explore the city's longstanding connection to the sea, make your way to Nausicaä Centre National de la Mer to find one of the largest aquariums in northern Europe.